Driving away from Valley of the Gods we knew we were going to head in the general direction of Moab. Why? Because our Tacoma is made for such terrain and adventures and we’ve seen stunning and amazing pictures of some of the overlanding that can be experienced there and so…Moab here we come. On the way up Highway 191 we passed through Bluff, Blanding and Monticello and, as we were cresting a hill about 30 minutes past Monticello (about halfway between Monticello and Moab) we saw an iconic brown sign with white lettering that said “Wilson Arch 1/2 Mile.” Up to that point, 120 miles up into Utah, we had not yet seen one arch and so immediately pulled into the right lane, slowed down and prepared to pull off and experience our first of this most iconic, Utah-style natural feature. As far as arches go this is a good one. With a 91 feet (28 m) span and a height of 46 feet (14 m) this is a large, thick and solid example of this type of geological rarity. Named for a local farmer named Joe Wilson who had a cabin not far away in Dry Valley. With a name like Dry Valley his farm was probably not too successful. Made of Entrada Sandstone the arch was created over 100’s of thousands of years much like many of the other arches in the general area were. Rain gets into crack and expands when it freezes. When the ice melts that water and the regular winds carry the broken pieces away. Eventually and if all the conditions are met then an arch might possibly be formed. 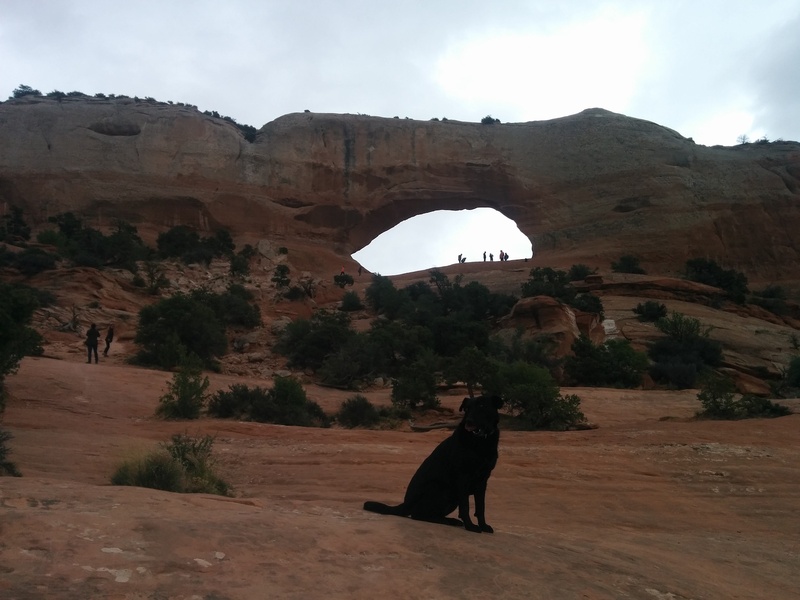 This is probably one of the most accessible arches in all of Utah. Not wheelchair accessible but “can drive pretty darn close to it” accessible. The walk to the base of the arch from the pullout off the side of the highway is slightly uphill but less than 100 yards with only the remaining last dozen or so yards to scramble up the not-too-steep sandstone to the arch itself. With the right shoes (we were breaking in our new Keen Hiking Boots) it is a breeze. Situated at an elevation of 6,150 feet (1,870 m) though this is the beginning of Utah letting your body know that it’s not at sea level anymore and you better take care of yourself. 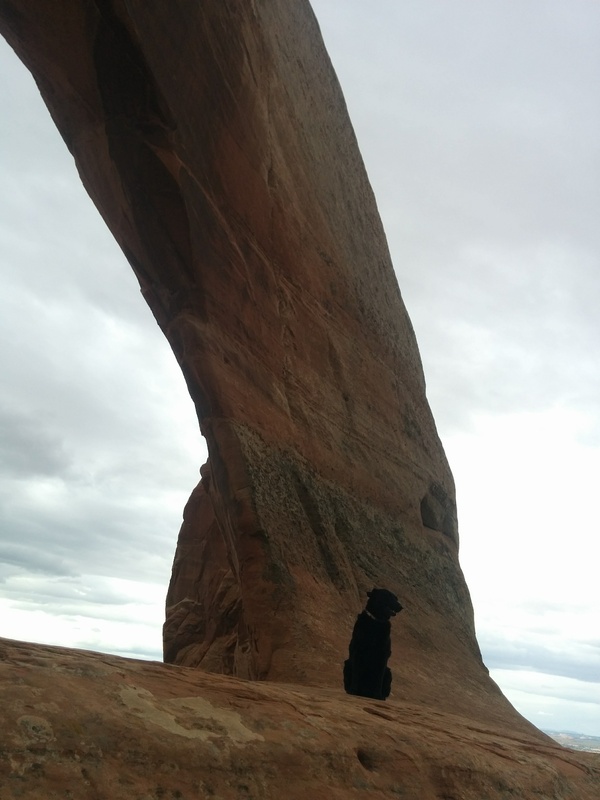 For a first introduction to arches and their geology this was perfect. Right off the side of the road with a quick, easy hike and then right back down to the Tacoma and on the road again towards Moab. If you find yourself in the area it is really hard to miss and certainly worth the small amount of time it takes to give it the once over. 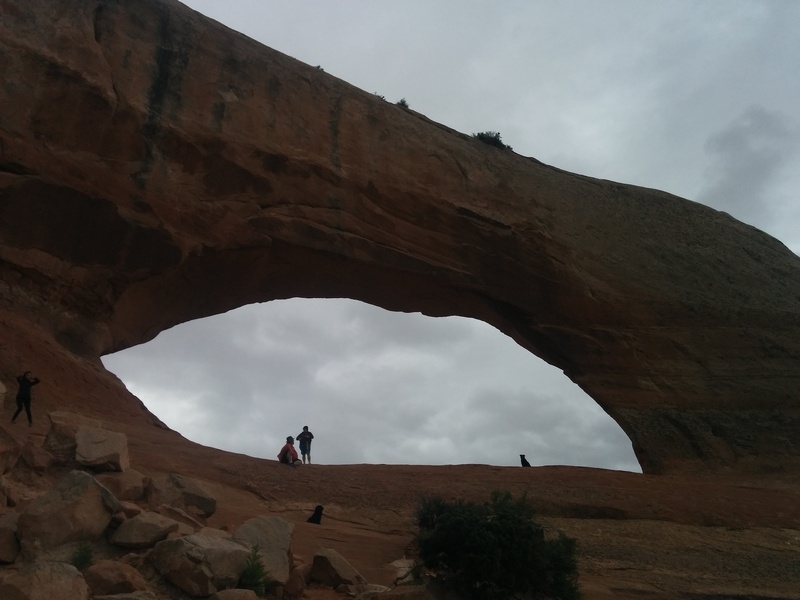 Considering that there are arches in the area that can only be reached my serious offroading or multi-mile strenuous hikes this is a must see. Have Fun Out There And Don’t Forget To Hydrate.